On May 20, 2005, The Simpsons aired its 400th episode, earning the distinction of being the longest running series in television history. Not bad for a show that started as a cartoon used between sketches for a comedy series. When the Simpsons joined the prime-time line-up, all the other sitcoms such as the The Cosby Show, Growing Pains, and Full House featured perfect families living perfect lives. Not the Simpson clan. They were headed by an oafish, self-centered, beer-swilling dad and an enabling, co-dependent mom, a sociopathic, manipulative son, a gifted yet whiny daughter, and a baby that would probably run away if able. The Huxtables they weren’t. Clearly, this was years before Eric Cartman killed his enemy’s parents, cut them up, and fed then to his nemesis in a bowl of chili. Ah, how innocent we all were in the early ‘90s. Over the years, The Simpsons went from a tacky, lowbrow cartoon to a critically acclaimed must-see mainstream pop-culture phenomenon. The show has earn at least 27 Emmys, Time magazine has dubbed it the 20th century’s best TV series, and it has spawned many millions of dollars in merchandizing. Homer’s catchphrase, the always useful “D’oh!” is now included in the Oxford English Dictionary. No, really. After 25 years, there are critics who moan that the show has lost its luster and lacks the spark, wit and focus of the earlier seasons. 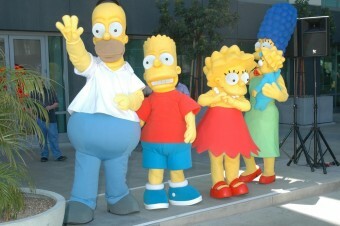 The Guardian’s Ian Jones wrote in 2007 that “The Simpsons of today revels in big, stupid antics, one-note gags and obvious plot twists,” but to be fair, there were fans complaining that the series was going downhill as early as season two. D’oh! I think you meant to spell “Groening” and “Ullman”. I’m not the biggest Simpsons fan out there, but, I’m a big fan.